Social scientists, whether earnest graduate students or tenured faculty members, clearly know the rules that govern good writing. But for some reason they choose to ignore those guidelines and churn out turgid, pompous, and obscure prose. Distinguished sociologist Howard S. Becker, true to his calling, looks for an explanation for this bizarre behavior not in the psyches of his colleagues but in the structure of his profession. In this highly personal and inspirational volume he considers academic writing as a social activity. Both the means and the reasons for writing a thesis or article or book are socially structured by the organization of graduate study, the requirements for publication, and the conditions for promotion, and the pressures arising from these situations create the writing style so often lampooned and lamented. Drawing on his thirty-five years’ experience as a researcher, writer, and teacher, Becker exposes the foibles of the academic profession to the light of sociological analysis and gentle humor. 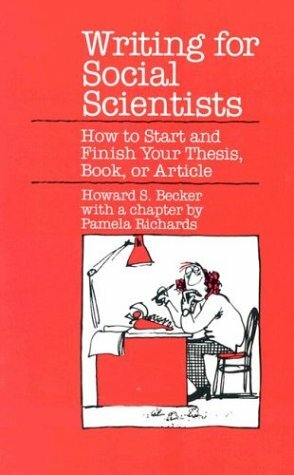 He also offers eminently useful suggestions for ways to make social scientists better and more productive writers. Among the topics discussed are how to overcome the paralyzing fears of chaos and ridicule that lead to writer’s block; how to rewrite and revise, again and again; how to adopt a persona compatible with lucid prose; how to deal with that academic bugaboo, “the literature.” There is also a chapter by Pamela Richards on the personal and professional risks involved in scholarly writing. In recounting his own trials and errors Becker offers his readers not a model to be slavishly imitated but an example to inspire. Throughout, his focus is on the elusive work habits that contribute to good writing, not the more easily learned rules of grammar and punctuation. Although his examples are drawn from sociological literature, his conclusions apply to all fields of social science, and indeed to all areas of scholarly endeavor. The message is clear: you don’t have to write like a social scientist to be one.